Swift Engineering demonstrates how to utilise 3D printing technology in the creation of hollow inlet ducts- commonly used in both aerospace and automotive industries. 3D printed composite tooling allows for part manufacturing with complex geometries to be produced faster and cheaper than any other conventional manufacturing methods. Additive manufacturing significantly impacts lead time in a sense that manufacturers are able to create a part from design concept to production, alongside fabrication of that part within a day. 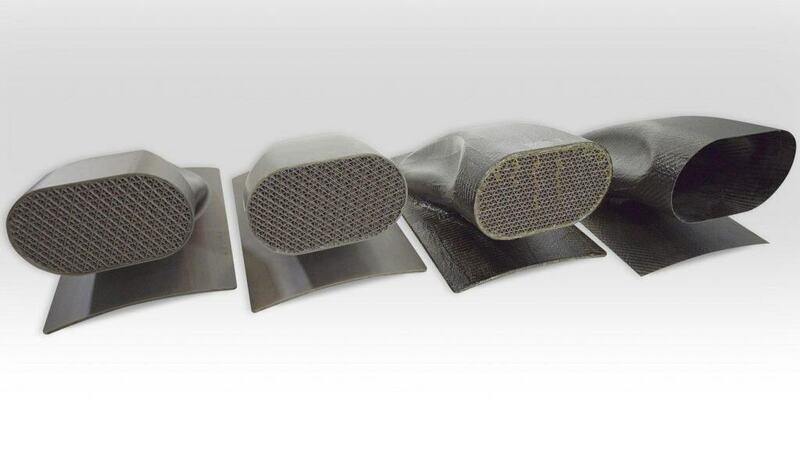 Using a Fortus 450mc, here are Dangs 6 Steps to composite tooling with additive manufacturing brought to you by Stratasys Platinum Partner in the UK and Ireland; SYS Systems. The use of additive manufacturing in composite fabrication begins with concept creation within the CAD design program, which is then brought to life in the form of a three dimensional printed object. This method allows for less seams on part surfaces, a reduction in time spent in post-production, and the ability to fabricate extremely complex tools by enabling designers to access and control inner surfaces of the part which is not possible when using conventional methods such as multi-piece tooling. Following the 3D printing process the tool is fully prepared by sanding down all visible anomalies to perfect the surface finish, mould sealant is applied on the tool ready for application of the mould release. The mould release is applied in order to allow for part separation after the curing process. Applied development is the first step of the part lamination process where patterns are cut dependent on the geometric makeup of each part, allowing the composite material to have the correct fibre orientation as well as maintain it, making it an extremely important aspect of the whole process. Once lamination is complete, the vacuum bagging process begins. Here the fibre-reinforced plastic is applied on to the tool, followed by the breather, the vacuum bag and the vacuum sealant tape. Vacuum checks are conducted to verify that the vacuum bag has no leaks. The next step is to load the laminated tool into an autoclave where pressure is used as an important parameter that allows for compaction during the lamination curing process. This means that the tools ability to withstand pressures of around 85 to 90 psi is integral to this step in the process. Stratasys coined its permeable triangular pattern particularly for its purpose as a support mechanism, critical to enabling the structure to remain hollow by withstanding autoclave pier pressures and temperatures. Once the part is cured, the vacuum materials are removed and discarded. The laminated tool is placed into a solvent bath in order for the tool to dissolve. Using 3D printed moulds as sacrificial cores allows for its dissolution in a detergent solution enabling a simple and cleaner way of removing the tool mould and leaving behind the end part. Following the dissolving process you are now left with your end part, which can now be bonded, trimmed or drilled in the next-level assembly.